I saw this recipe and knew I wanted to give it a go. Here is my take on a divine asparagus, spinach, onion, and feta quiche -- perfect for anytime of day and light enough that you feel good eating it. This recipe is so easy! Place 1 pie crust into a glass pie plate. Set in fridge while you work on everything else. Grab your asparagus pieces, box of frozen spinach, diced onion, and place into a saute pan with a drizzle of olive oil. Saute until asparagus pieces become tender and spinach is heated through. Eliminate any extra water that may have come from the frozen spinach. While vegetables cook, prepare filling. Whisk together milk and eggs. Then gently stir in feta and mozzarella. Add a pinch of salt and pepper. When vegetables are finished, grab your pie plate and pour vegetable mixture to fully coat the bottom of the pie plate. Then pour the egg/cheese mixture over top. Bake in the oven for approximately 45 minute or until the quiche essentially sets. I absolutely loved this! Confession: I've never made a quiche before. This was perfect though. Not too eggy, which is important. The crispness of the crust and the freshness from all the veggies makes this meal perfect for any kind of meal. I served this with a salad and it was perfect for dinner and as leftovers for lunch the next day at work. 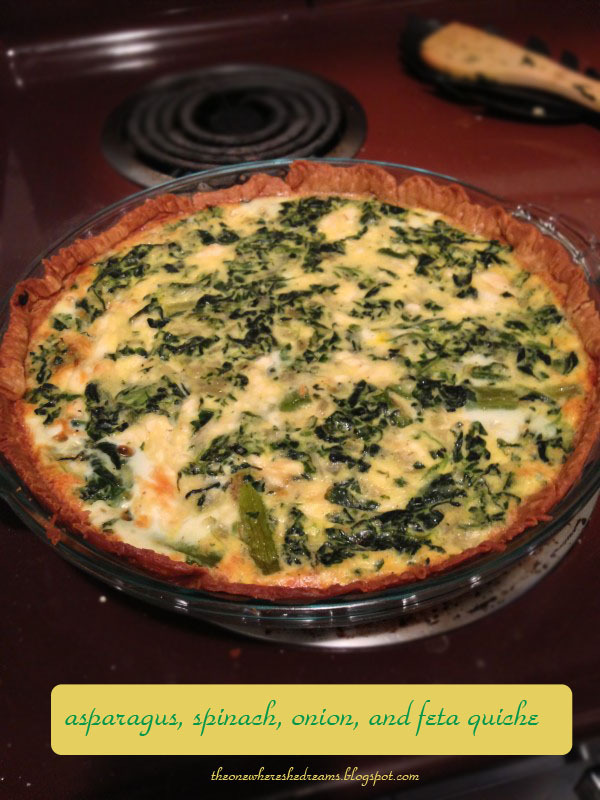 I didn't realize quiche could be so easy. I am going to try this one day, it sounds delish! This is super easy! I thought it would be more complicated too, but it wasn't. I'm really quite excited to see what kind of combinations I can come up with. I think something breakfasty would be lovely! As a newly relocated Chicago gal, I am loving every second of exploration and discovery. With a great city and a job I adore, I spend my time crafting new recipes, creating far too many do-it-yourself projects, and taking the city by storm. Welcome to my corner of the blogging world.